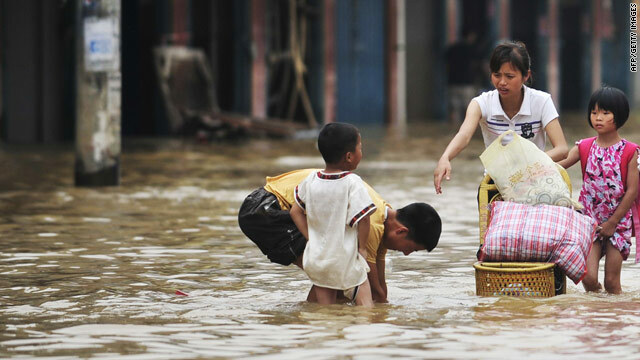 A family makes its way through floodwaters in central China. (CNN) -- More than 100 people had a "slim" chance of survival after being buried by a rain-caused mudslide Monday afternoon in southwest China, the state-run Xinhua news agency reported. The dire assessment came from local rescue officials in Guizhou Province, Xinhua said. The landslide trapped 107 members from 38 families in the village of Dazhai, the news agency said. Rescue efforts were under way. Vice Premier Hui Liangyu was reported to be heading to the site with a team of experts and officials. A survivor described the mudslide's suddenness, leaving little time to escape. "I called the others to flee. But it was too late. I saw some people behind me being buried," villager Cen Chaoyang told Xinhua in a telephone interview. Rescuers had to run three miles (five kilometers) to reach the site, which is not accessible by vehicle. Rain and landslides continue to plague the region, Xinhua said.